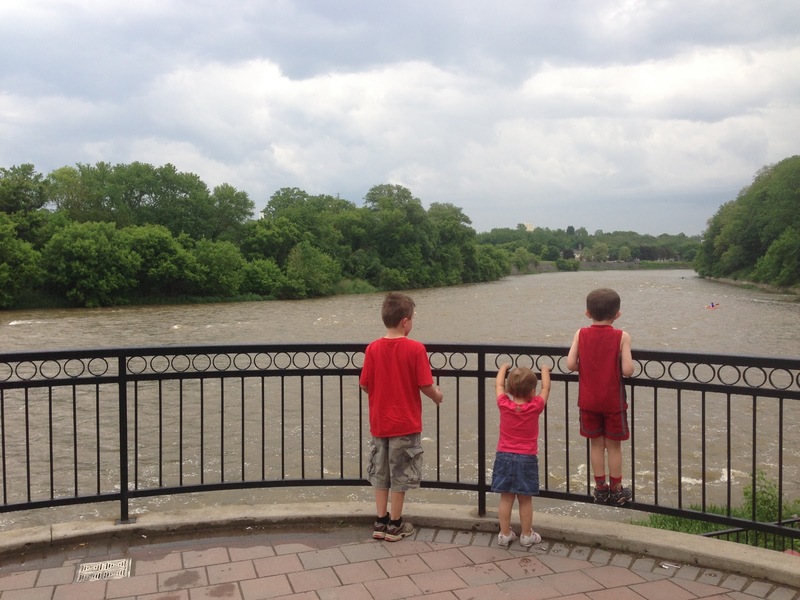 Enjoying the view of the Grand River in beautiful Paris, Ontario where I do my long runs. These runs are enjoyed with friends on soft gravel roads with scenic country farms, which remind me of my home farming community near Alvinston, ON. 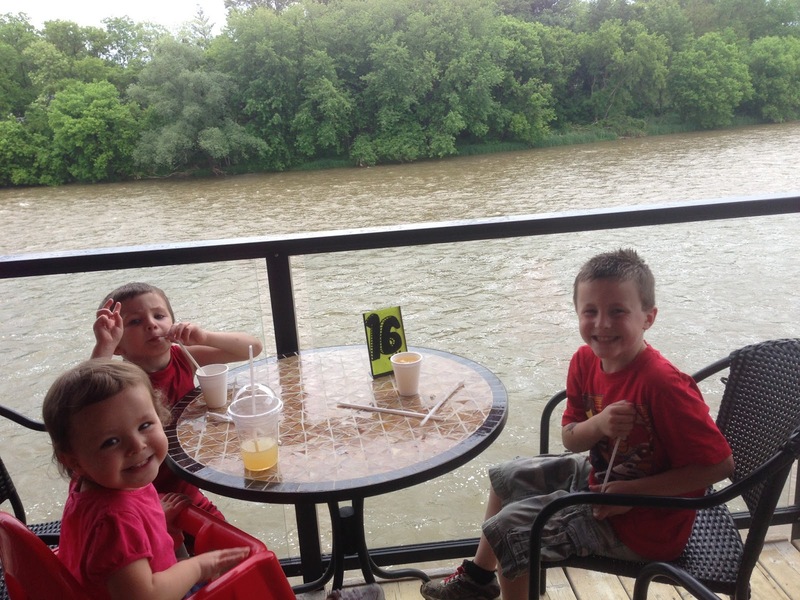 Once in a while when daddy isn’t home and I don’t feel like cooking, I take the kids out to eat! 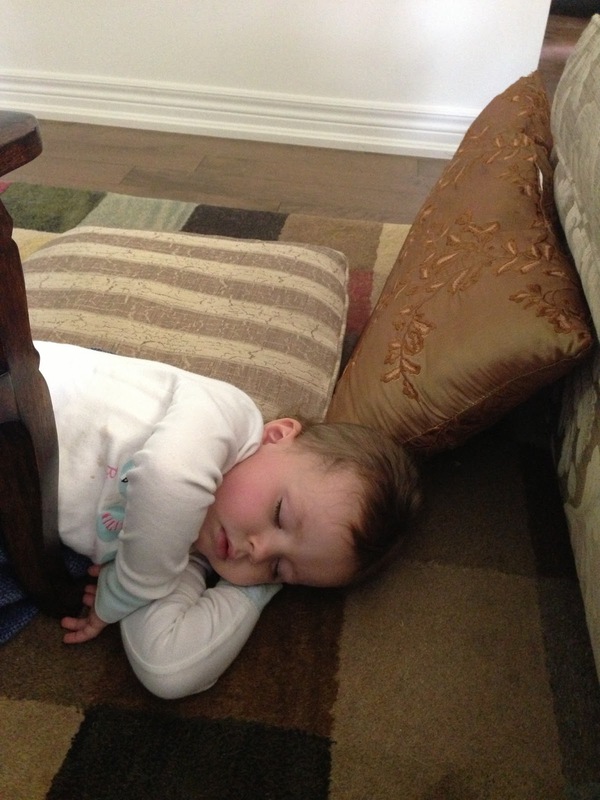 While I was dozing on the couch, recovering from a nasty stomach flu, poor Leah decided to also take a rest. I know I’ve said it many times before and I will again. 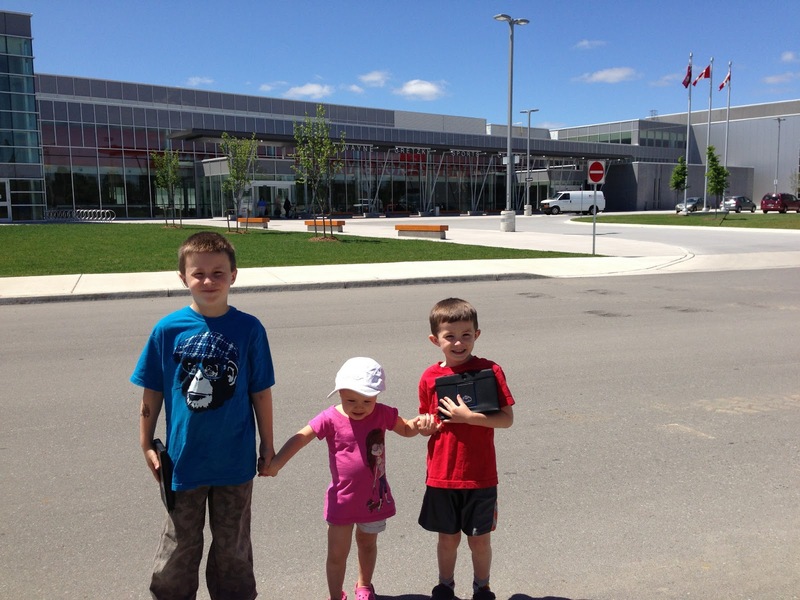 I’m so grateful for Maureen and Jeanetta at the Wayne Gretzky Sports Centre where I train. The boys are getting a bit old for the childcare but seemed to do ok Monday (PA Day), which is a good sign for my summer training. Hard to believe they’ve cared for each kid since birth! When leaving the gym after nearly 3 hours of training, I often say, “And now it’s time for the real work”! 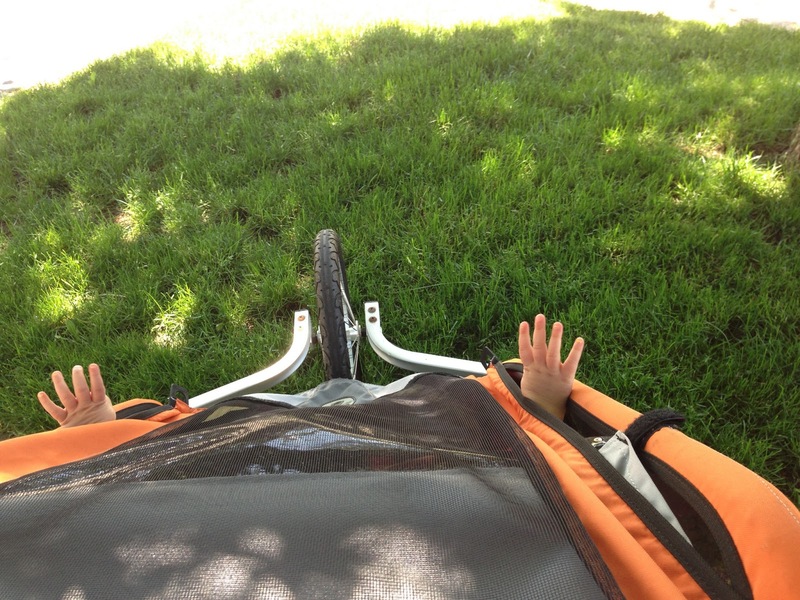 Each child has done this while I’m pushing the Chariot on a run. I think it’s the cutest thing, which makes me think it’s the Chariot’s wings! With Jonathan working early (and returning late) for three weeks, there’s going to be a lot of miles logged with the Chariot. Today we did 26 km. You can see that Leah is equipped with several toys to keep her entertained. Recovery after the Ottawa 10 km was fairly smooth. I was glad to get in 30 km on Saturday in order to have a complete day off, Sunday. Monday morning I was back in the water for pool running and lengths, followed by my usual treadmill tempo workout. Wednesday was 16 x 400 m repeats with (click here) Natasha Yaremczuk (and here), who is coached by Rick and in Paris for the summer. It will be great to get to know her and train together. And Tuesday and Thursday I got in a 22 and 25 km run before 7:00 a.m. Thursday night I attended a Kenyan Kids Foundation information meeting and brainstorming event. It’s quite exciting to learn about the three major areas of work – education, health care and farming, as well as the start of the Canadian foundation. I look forward to the many exciting events planned in the next year. Friday was a steady run with time in the pool, and Saturday I had a great 40 km run with a great finish. Then later that day, I knew something was wrong when I wasn’t hungry at my usual 5:00 pm. A few hours later I knew I had a nasty case of the stomach flu, which Leah had a few days prior. I must say that the timing made sense with the events of the last month. I was due for a bit of a crash. I had already logged a decent number of km’s so wasn’t too concerned about Sunday. I managed to total 160 km with an easy 12 km jog Sunday afternoon, after nibbles of honey toast and staying home from church with Leah, and Seth who also came down with stomach flu Sunday morning. After a shower and a simple dinner, I was in bed immediately after the kids. I slept from 8:45- pm – 7:00 a.m.! Monday morning I was back in the pool and on the treadmill again. Funny how you can be wrapped around the toilet one day then running well again two days later! Guess my body just needed a good 24 hours to repair and restore! This week the plan is to log 170 km. Saturday will be a pace-specific long run with a tempo in the middle. Darren Lee and Rachel Hannah are joining me with Rick on the bike so it will be good. This week and the next two are going to be busy. Jonathan is working long days, out of town so I can’t get any early morning runs in during the week. 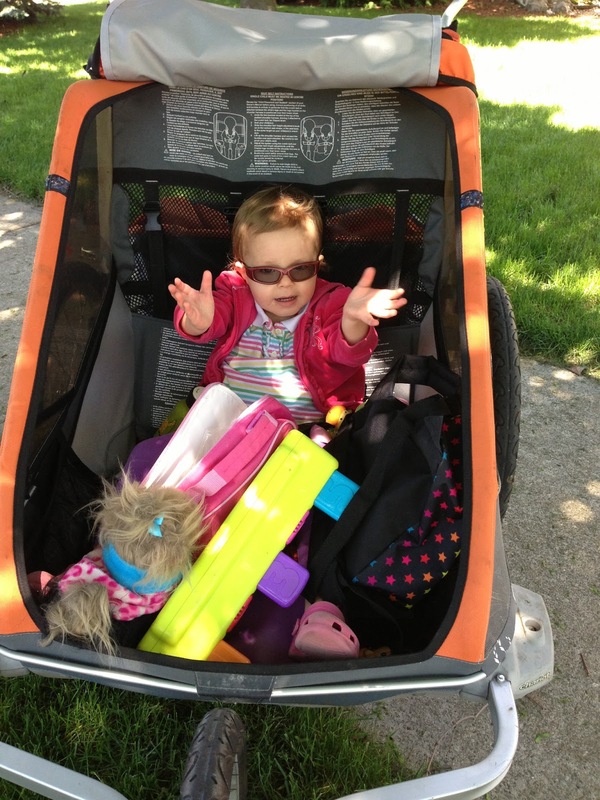 That means I’ll be taking Leah twice per week in the Chariot for 25 km runs. It’s harder but makes me stronger. We are busy with end of the year school activities and I’m between racing (next race is Vancouver 1/2), when the real work is done, so it will be important to take extra care of myself. I still haven’t been to our normal church service since Andy died due to my cousin’s wedding, my race and recent illness so I really look forward to it. Just yesterday, June 3rd was a tough day as it was 18 years since my dad died and we attended the visitation for my friend’s dad who also died of cancer. 2 Dear brothers and sisters,[a] when troubles come your way, consider it an opportunity for great joy. 3 For you know that when your faith is tested, your endurance has a chance to grow. 4 So let it grow, for when your endurance is fully developed, you will be perfect and complete, needing nothing.